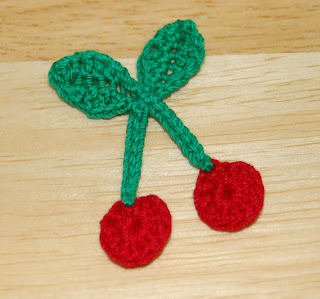 Little cherries are so cute, and are very versatile when it comes to appliques or embellishments. They can go on bags, hats, and just about anything for the kitchen. They are so easy to make- the putting together can be a little challenging, but they turn out so cute! Works out to be 1.25 inches wide, 1.75 inches tall using size 10 crochet thread and a size 7 hook. Using the Magic Ring, 12 DC. Fasten off. Attach Green yarn to any CH on cherry. Ch 10 (or to desired length), sl st in 2nd ch from hook, and each ch back to the cherry. Fasten off. Make two of each piece and stitch them all together! Thank you so much for sharing your wonderful patterns for free. It feels like sharing the love. Keeps the world going round.